Mason Ginsberg and Jake Madison give their takes on the Pelicans’ come from behind victory against the Nets in New Orleans tonight. Below the video, you can find some of the themes of our conversation. After starting Davis and Babbitt against a team with no true center (Miami) on Saturday night, the Pelicans started out against another team with no true center with Davis and… Stiemsma. Puzzling, to say the least, and it left the Pelicans in a 58-42 halftime hole. After Stiemsma checked out early in the 3rd quarter, New Orleans outscored Brooklyn by 20 points from then until the end of the game. The Pelicans were able to force the Nets into shots from inefficient spots on the court in the 3rd quarter, winning it 31-18 to cut the deficit to just 3 points heading into the 4th quarter. The 4th quarter featured both more of Luke Babbitt and Anthony Davis and then a bit of Aminu at the 4 with Davis, although poor decision-making by Aminu is arguably what allowed the Nets to get the game to overtime. In OT, though, the Pelicans actually used four guards with Davis, which worked pretty well against a Nets team missing both Brook Lopez and Kevin Garnett. Pick and roll defense really hurt the Pelicans in both games against the Nets this season. In Brooklyn, players were often over-hedging, which led to a monster night for Mason Plumlee. Tonight, defenders sometimes didn’t hedge enough, allowing for some wide open 3-point looks. The Pels got burned by this in the second quarter, but thankfully the Nets missed a bunch of them in the second half. Tyreke Evans was a monster tonight, finishing with 33 points on 19 shots to go along with 10 rebounds and 7 assists. He committed 7 turnovers as well, but 4 of them were in the 1st quarter while he was playing alongside two lane clutterers in Greg Stiemsma and Al-Farouq Aminu. If Evans and Gordon are both on the team next year, Evans’ play as a starter should cement him in that role, and if either is going to come off of the bench, it should be Gordon. Tyreke simply affects the game in more ways than Eric. Gritty effort from Brian Roberts tonight, who had a brief scare with a knee injury on a foul. He ended up not only returning, but hitting both free throws. Roberts finished with 17 points on 11 shots, 6 assists, and 3 rebounds. Pelicans play the Clippers on Wednesday night. Key to victory? Big surprise – Anthony Davis. His performance, especially defensively, could be what keeps New Orleans in this game. Thanks for your feedback, everyone! Hopefully everyone enjoyed the video recap. A little different than what we normally do. Give us your feedback because I’m too scared to watch it: I hate the sound of my voice on recordings. I prefer the write ups, personally. No offense to you guys but videos can be a little drawn out and the points arent as specific and concise. johnny o bryant III from LSU would be an ideal fit for this team next year..
Hi guys, my friends backed out on me for our season tickets. I’m looking to renew my seats and split the season w/ someone. If you are interested please contact me at dleboeuf84@yahoo.com. My tickets are in club D section, behind the pels bench in 111. I have to renew by march 31 to lock in this years prices, which is 60$/game. The face values range from 33$-160$ depending on the opponent. Apologies for my apparent strobe lights… not sure why that seems to always happen on my laptop! How about a short video with a decent write-up? By the way, I watched the video. Yeah that’d be good if the videos are really worth it. But I don’t think the video is completely necessary when it can mostly be said in written words. I like that they’re at least experimenting though, after feedback from recent articles. Jason Calmes Agreed; seems to be a better structure. I’m adding the highlights from our discussion to the post now. Too long, too. Make it DVD extras? Keep working and gold will be struck. 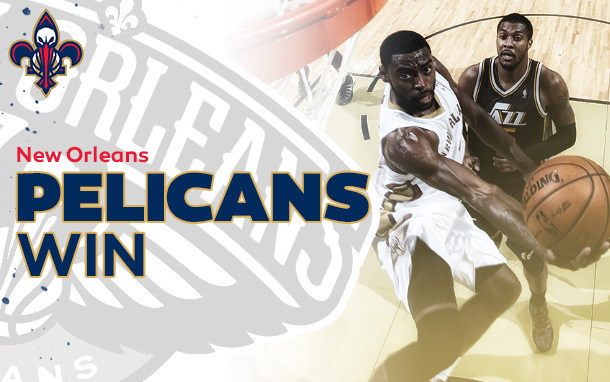 pelicans are 5-0 in overtime this season…..CLUTCH! I still prefer the write-ups but the video is a good idea and a nice mix-up every now and then. Couldn’t be more proud of this team right now. But honestly, why does Greg Stiemsma ever play. I feel like he single-handedly disrupts Tyreke’s effectiveness. Any time I can remember the Pelicans doing anything positive, it happens when Steamer is on the bench. Tyreke is worth every penny that we’re paying him. Many around the NBA are saying he’s a bust because he can’t shoot a jumper. . . but with the way he can get to the rim, does it even matter? I love this guy. If he walked on water, they’d say he can’t swim. Awesome game. Line ups and defensive matchups frustrated me, but the team overcame those poor decisions and had a massive comeback over a team that lost their legs. It’s good to see this team getting a little bit of a personality after all the injuries pre-all star break. Some big tests remain this week. I look forward to seeing the Reke/AD duo against LAC and D Jordan. Defensively, I hope Monty doesn’t take AD away from the basket by putting him on Matt Barnes like he did with Paul Pierce. Then there’s the Spurs who always burn us. In the Spurs system, their frontline likes to stay in the paint. I wonder if Monty will try to exploit that or again go with the Steamer until it’s too late. As Pelicans fans, we’ve waited all year to get exicted about something and build hope for the future. These 2 games have done so. Enjoy! P.S. Props to Brian Roberts. Tough dude. Jason Calmes Screen shots of interesting stats could be incorporated, too. If we were in the East, we would DESTROY! I like the video review, even though it ran a bit long. Nice to see the extra effort. I couldn’t watch cause I’m at work, but I listen on my headphones. Caffeinedisaster thanks. If/when we do it in the future, we’ll make the videos shorter and ensure the written recap is comprehensive. Jake Madison How about you and I do a pre-game podcast from the Beer Garden before each game. Or maybe At Manning’s what do you think? Tyreke got the “Whoah Boy!” award on the Starters. They’re stepping out of the box on these recaps. I like it, since I cook a lot I can listen to the recap/ great podcasts while throwing down in the kitchen.